6 to 7 medium size (green/purple) eggplants. Cut Eggplants(Brinjals) lengthwise. sprinkle turmeric powder and salt on the sides of the eggplant slices and keep it aside for 10 minutes. Meanwhile, Cut Onions lengthwise. Heat 1-tablespoon oil and sauté onions until it turns translucent. Add very little salt and pav bhaji masala powder and stir for a couple of minutes and keep it aside. Use very little quantity of pav bhaji masala as it may be to spicy. In a hot tawa, place a couple of brinjal slices and sprinkle pav bhaji masala powder and shallow fry it. Turn the side and sprinkle masala powder on the other side too and shallow fry until the eggplant is cooked. Repeat this until all the eggplant slices are cooked. Arrange the eggplant slices in such a way that the sautéed onions are sandwiched between the slices as seen in the picture. Garnish with sliced tomatoes and serve immediately. This can be done using Garam masala powder and Red chilli powder instead of pav bhaji powder. The eggplants can be prepared in oven too. For this method, after setting aside the slices with turmeric and salt for 10 minutes, apply oil on both sides of the slices and sprinkle masala powder and cook in a preheated oven at 375 degrees for about 10 minutes or until the slices are cooked. place in a greased non stick oven safetray for best results. 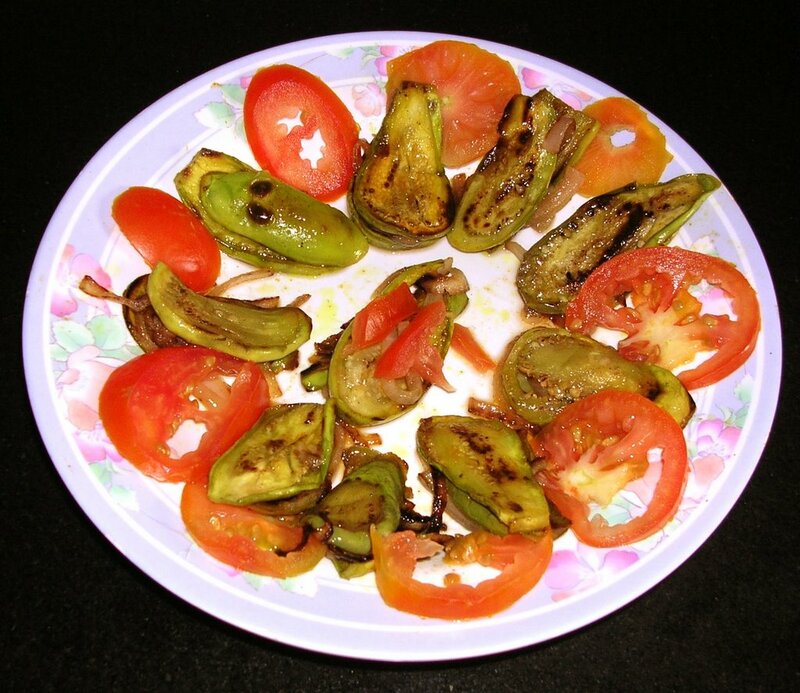 thanks for the brinjal fry recipe. Awesome delight with very few ingredients. Oh my my !!! never in thousand of years i cna think of such a simple yet delicious dish with eggplant as salad. thanks for sharing and participating with this Mythreyee.